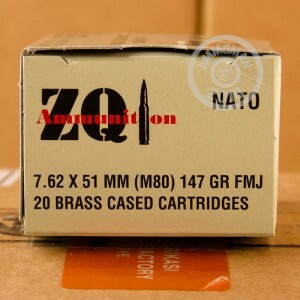 If you are looking for a great quality range training ammunition, check out this 7.62x51mm FMJ from ZQI. This round is NATO spec ammunition and newly manufactured in Turkey. It has a 147 grain full metal jacket projectile that will penetrate your target with accuracy and precision. ZQI is popular with sport shooters due to its high level of dependability and affordability. You don't have to sacrifice quality when choosing an ammunition that won't break the bank, which is what you get from ZQI. 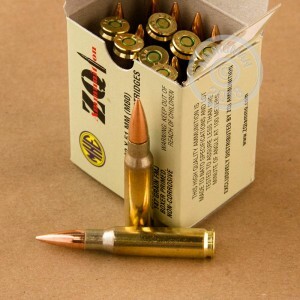 These cartridges are boxer primed and have brass casings. They are also non-corrosive and reloadable. ZQI Ammunition is based in Afton, Virginia. 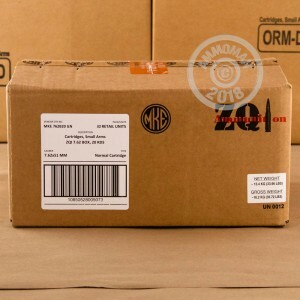 Their ammo is manufactured to NATO specifications in state of the art facilities. Their products include 9mm, 5.56, and 7.62 ammunition. Order your 20 rounds and head to the range! Good product. recieved as stated. Product arrived quickly, just a few days. All rounds are uniform in size, brass is clean and with damage. Bought these rounds to store. Great price and free shipping. Fired 60 rounds thru my Cetme rifle not 1 ftf or fte.